This title features 16 three-step sequences illustrating the past, present and future tenses of familiar activities. Eight verbs have regular, and therefore predictable, past tenses. The other eight verbs have irregular past tenses. Ten of the sequences show singular verb forms with one person doing the activity, and six show plural verb forms with two people involved. 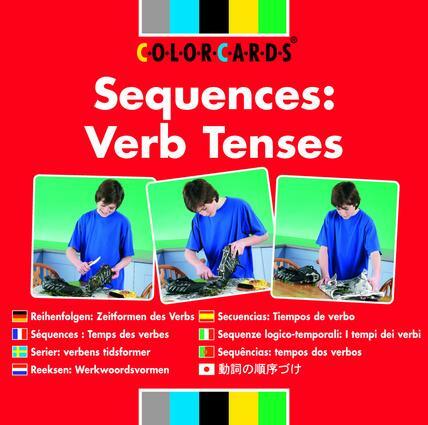 Individual cards can be used to focus on one tense, or use the whole sequence to contrast past, present and future tenses. These cards are a flexible and fun resource for language teaching and therapy with people of all ages and backgrounds. This bestselling series contains inspiring, professional materials designed to help develop both language and social skills. Uniquely created for use by professionals including speech and language therapists and educators, colorcards® are designed to support students of all ages and abilities. The images of real objects, people, situations and activities are chosen and photographed with great care to maximise the educational benefit for students from early years through mainstream education and special education, to adult learning and ESOL.